Tailevu escape with a 21-20 victory over Tropik Pine Lautoka at Church­ill Park yesterday to force their way back into the 2019 Skipper Cup Premiership competition. After winning the Vodafone Vanua Cham­pionship semifinal, team manager Levani Matea said it was their aim all along to play in the Premiership. The two top teams from the Vanua compe­tition automatically qualifies while the two bottom teams frpm the Skipper Cup will be relegated. This means that Tailevu and Northland will play in the Skipper Cup while Navosa and Malolo will play in the Vanua competi­tion. “We knew the match would be tough but we set our target from the start of play in the Skipper Cup competition after two years. “We are back where we were supposed to be, playing with the big boys,” Matea said. What happened: Tailevu looked impressive in the first few minutes with wing Ilikena Vudolo scoring a try which was unconverted in the 8th minute. But it was all Lautoka from there, scoring three tries which were not converted to Moa­la Nakia (16th minute), Opeti Ratucati (22nd) and Rusiate Matai (27th) to lead 15–5. However, Lautoka’s missed conversions proved too costly as Tailevu hit back with a try which was converted by halfback Autiko Domonikibau to bridge the gap 15–12. Three penalties to Etonia Rokotuisawa ex­tend their lead to 21–15. 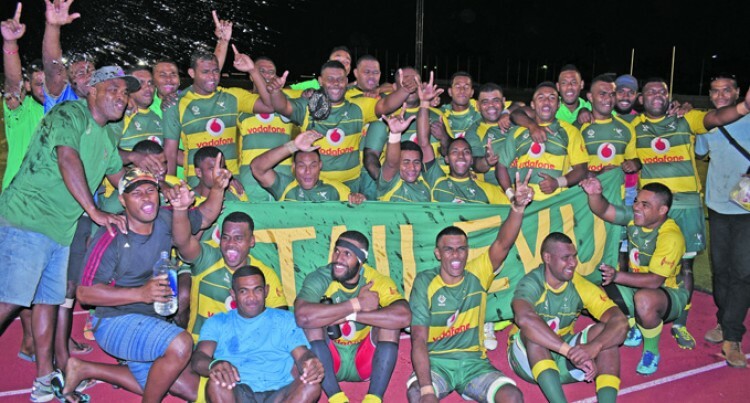 Lautoka struck back through Epeli Radani­va, but first five –eighth Sireli Satala missed the conversion. Big Play: Rokotuisawa kicking game.